Postcards are good souvenirs and a good reference. If you’ve traveled to Bulgaria, you’ll probably recognize the cities and towns on these postcards. 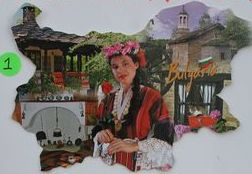 You probably ate some delicious Bulgarian foods, saw authentic folk costumes, instruments, and crafts. Maybe you bought these postcards but mailed them to your friends and didn’t keep any for your travel album. Here’s something to add to your scrapbook. If you haven’t yet seen Bulgaria, maybe these scenes will inspire your travel plans. PRICES: Most of the postcards are $1.50 each or 5 for $5.00. Order postcards by number & topic. Collectors, remember that Bulgarian postcards are metric. The typical rectangular postcards convert to about 4¼" x 6½" so they won't fit in standard US 4" x 6" albums. Other cards are slightly longer at 8½" x 4¼" - Several irregularly shaped cards are even slightly larger. only 2 left Card #A - 1 Bulgaria, one of several cards shaped like the map of Bulgaria, about 8" at the widest point. Funny story -- someone mailed a Bulgarian map-shaped card to the USA. The card arrived in a USPS plastic envelope for damaged mail, with a printed notice saying, “Sorry, we tore your mail,” to explain the irregular shape. The two special long costume cards below each measure 9½" x 4½"
PC#28 black or PC#29 blue, $1.75 each / 2 for $3.